Joy Creek Photo Archive (c) all rights reserved Clethra alnifolia 'Pink Spire' bears 4-inch bottle-brush spikes of scented pink flowers that perfume the air of the late season garden. 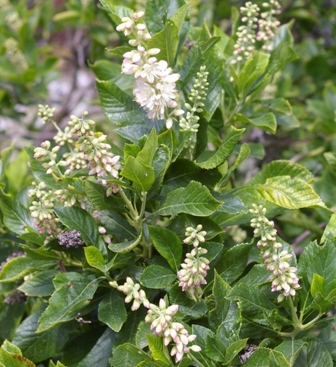 The distinctly veined foliage has a light gloss giving the entire shrub a low glow. The candle-spikes of spent blooms remain until winter. Late summer to early autumn. 6 ft. x 5 ft.